The anima is both a personal complex and an archetypal image of woman in the male psyche. It is an unconscious factor incarnated anew in every male child, and is responsible for the mechanism of projection. Initially identified with the personal mother, the anima is later experienced not only in other women but as a pervasive influence in a man’s life. The anima is personified in dreams by images of women ranging from seductress to spiritual guide. It is associated with the eros principle, hence a man’s anima development is reflected in how he relates to women. Within his own psyche, the anima functions as his soul, influencing his ideas, attitudes and emotions. 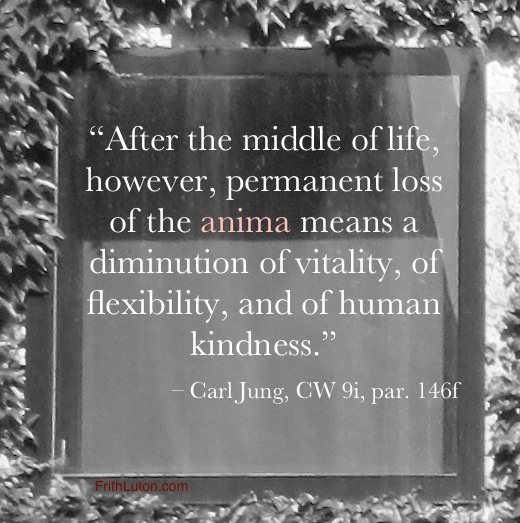 As an inner personality, the anima is complementary to the persona and stands in a compensatory relationship to it. Hence the character of the anima can generally be deduced from that of the persona; all those qualities absent from the outer attitude will be found in the inner. Similarly, where a man identifies with the persona, he is in effect possessed by the anima, with attendant symptoms. In the first stage, Eve, the anima is indistinguishable from the personal mother. The man cannot function well without a close tie to a woman. In the second stage, personified in the historical figure of Helen of Troy, the anima is a collective and ideal sexual image (“All is dross that is not Helen” – Marlowe). The third stage, Mary, manifests in religious feelings and a capacity for lasting relationships. In the fourth stage, as Sophia (called Wisdom in the Bible), a man’s anima functions as a guide to the inner life, mediating to consciousness the contents of the unconscious. She cooperates in the search for meaning and is the creative muse in an artist’s life. Ideally, a man’s anima proceeds naturally through these stages as he grows older. In fact, as an archetypal life force, the anima manifests in whatever shape or form is necessary to compensate the dominant conscious attitude. So long as the anima is unconscious, everything she stands for is projected. Most commonly, because of the initially close tie between the anima and the protective mother-imago, this projection falls on the partner, with predictable results. No matter where a man is in terms of psychological development, he is always prone to see aspects of his anima, his soul, in an actual woman. The same is true of the animus. Their personal aspects may be integrated and their significance understood, but their essential nature cannot be exhausted. One way for a man to become familiar with the nature of his anima is through the method of active imagination. This is done by personifying her as an autonomous personality, asking her questions and attending to the response.